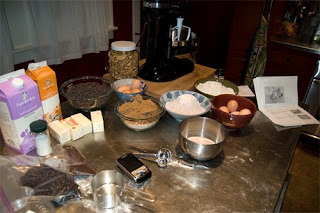 So, Sunday night, I set out a gazillion ingredients and got to work making a double batch of chocolate chip cookie dough and a batch of coffee ice cream batter. The cookies were for a workshop on Tuesday - I kept the dough in a ziploc bag and baked Tuesday morning. The ice cream is for myself and has yet to be churned. But, I consider this round of ice cream an experiment, and I'll let you know if it was worth the effort. Stay tuned for the part 2 that's really part 1 because this post is just about chaos in the kitchen. Consider this post an endorsement to be messy and go crazy and take on way more than you think you can do on a "school night" no matter how tired you know you'll be on Wednesday (or how tired you should have known you'd be).